Q Are we too late for SPECAL? A If you are interested in the information on our website then you are certainly not too late to adopt the SPECAL method! Any family committed to exploring ways to improve quality of life for the person with dementia, and prepared to explore the SPECAL approach to understanding and managing dementia, is neither too early nor too late. We would say that you are spot on time! 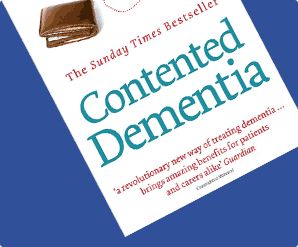 The best possible start would be to read ‘Contented Dementia’ by Oliver James. Provided that someone, somewhere, still cares about the person with dementia, they will be able to use the SPECAL method to improve the quality of life for the person with dementia in surprising and sustainable ways. The important thing for families is to believe in their own ability to make a difference, and then everyone is off to a flying start. One of the latest referrals we have ever been involved in was a family where the father had had dementia for several years. He then had a serious fall, was taken to hospital and his wife was told that he only had a week to live. The following day she learned about our work. The family took a bit of convincing that there was any point in developing a SPECAL care plan, but then decided to give it a go. During that last week they worked out what one object the father would most like to see on his bedside table as he gently exited from this life. There were many possibilities, but the one that connected best with him was a small painted box which had been given to him by his own father when he was very young. The work involved in defining that very special object involved all the family and gave them a particular focus for that final week. After their father died the family declared that they had all gained so much themselves in finding the key to his contentment during his last days – more than anyone had dreamed possible. The Contented Dementia Trust view is that it is never too early for carers to learn new skills and start practising them, and never too late to make a difference as long as someone still cares. 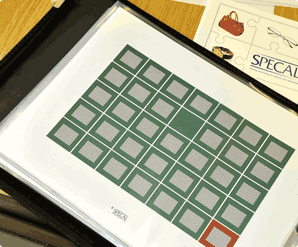 However, the earlier after diagnosis that the SPECAL Photograph Album and the associated SPECAL method is understood by carers, the more likely they are to be able to sustain the well-being of the person throughout the dementia journey. Find out more about how the SPECAL method works. Q I care for my husband who has Alzheimer’s. Can you give me some useful tips? A Yes, absolutely! 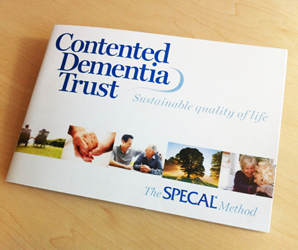 We offer a range of dementia specific Courses and Services designed to help carers develop what we call SPECAL sense. SPECAL sense is an essential skill which you certainly need if you are to care for your husband in the most appropriate way. Follow the links to find out more about our Family & Friends Introductory Courses or contact us for more information. Q Do you charge for your services? A We are a small independent charity which aims to extend our training and services to as many people as possible and must cover our costs in order to continue our work. We keep all our fees as low as possible and are continually fundraising for each part of our programme. However, we must emphasize that personal financial circumstances need not be a barrier to anyone wishing to contact SPECAL, and we are happy to discuss individual situations. Q I work as a professional carer with people who have dementia. Are your friends and family workshops suitable for me to attend? A Family carers and dementia care professionals have different learning requirements so we have designed separate workshops for professional carers. We also run tailored training courses for groups of professionals who work together or share the same discipline. A Click on the link in the question and you will be taken to a PDF of the important information sheet. You can then print this sheet off as many times as you need. A Click on the link in the question and you will be taken to a PDF of the guidelines for visitors sheet. You can then print this sheet off as many times as you need.